Most of Mark's life has been dedicated to his most prolific music endeavor, DEVO - a college art project that blossomed into a long career for the Akron quintet. DEVO is widely known and respected as one of the most important bands to emerge from the 70's & 80's. Starting with their debut LP in 1978, Q: Are We Not Men? A: We Are Devo!, DEVO continued to release nearly 20 albums over the next 20 years, and spread their controversial message about the devolution of the human race to a worldwide audience. They punctured the mainstream with their 1980 hit, Whip It, and reached millions of people who would have never heard their unique brand of music without major label distribution and radio airplay. DEVO continued to release albums which featured minor hits throughout the 80's. They've performed live sporadically, but consistently, since the mid 1990's, and released "Something For Everybody" in 2010, their first album in 20 years. Shortly before DEVO took a hiatus in the mid 1980's, Mothersbaugh scored a Hawaiian Punch commercial, orchestrating factory sounds to create a rhythm track for a computer animation of dancing machinery & robots. More projects were sent his way, including the Pee Wee's Playhouse TV show, for which Mark provided the very memorable theme. He also scored several complete episodes of Pee-Wee's award-winning CBS TV series. Soon after, Mark found himself providing the soundtracks to 100 episodes of the Disney Channel's Adventures In Wonderland, along with some 420 songs. More scoring projects continued to seek Mark's talents throughout the 1990's, and necessitated a move to a larger studio, now located in the big, round, bright green building on Sunset Blvd. in West Hollywood. Mark still creates music on a daily basis at Mutato Muzika, his Los Angeles based company, which is responsible for a plethora of current television, movie, and commercial scoring. Mutato's recent projects include the movies The Royal Tenenbaums, Rushmore, Welcome to Collinwood, Rugrats The Movie, and Wes Anderson's The Life Aquatic with Steve Zisso. Recent scores for TV include The Mind of the Married Man, Hidden Hills, MD's, LAX, as well as advertisements for Target, Swiffer, Apple Computers, Hummer, Sprint, and Mastercard. Mark's recent movie scores include: The Big White, starring Robin Williams and Woody Harrelson, and Herbie: Fully Loaded, starring Lindsay Lohan, Lords Of Dogtown, First Decent, The Ringer w/ Johnny Knoxville, and How To Eat Fried Worms. He has also created music for several popular video games including Crash Bandiecoot, Jak and Daxter, Sims2, and Frogger: Ancient Shadows. 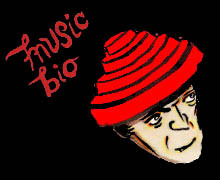 Get more info on Mark's Mutato Muzika company at the Mutato Web Site. Mark Mothersbaugh continues to permeate pop culture.